Approximately 711 Weeks (Sabbaths) Remaining Till Christ's Return! Approximately 712 Weeks (Sabbaths) Remaining Till Christ's Return! Approximately 713 Weeks (Sabbaths) Remaining Till Christ's Return! They say a picture’s worth a thousand words, well, this one is for sure! 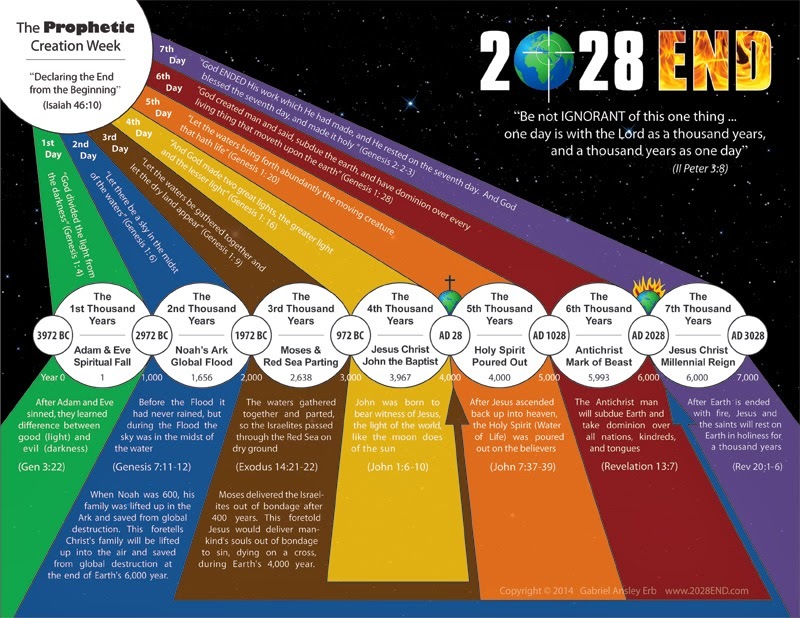 For the past month or so, we here at “2028 End Ministries” have been designing a one page, full color, pictorial style Creation chart, which beautifully expresses God’s 7000 year Master Time Plan for planet Earth as prophesied through His 7 Day Creation story. The chart is finally done and ready for print! For sometime now I’ve been receiving emails from people asking how they can best help spread the word of this ministry. Some even desire to do street ministry. Because of this we felt led to create the Creation chart flyer. 5000 copies of the chart will be printed out initially. It will be folded twice, in a tri-fold manner, allowing it to be easily handed out on the street. It will contain informative text on one side, as well as the Creation chart on the other. The Creation chart displays 7 light lines bursting out of a top left-side Creation circle. Each one of the light lines represents one of God’s 7 Creation Days, and each light line (Creation Day) falls on a smaller circle, representing a thousand year period. Inside the light of the light lines is written the prophecy God made in the Creation story about the most important event to occur during that particular millennium. Even now I’m finding it hard to be brief in describing the Creation chart, for as I said earlier, it’s definitely worth a thousand words! We are currently working on designing and writing the text for the other side of this eventual flyer. But for now, please click on the link below to enlarge the Creation chart, then enlarge (magnify) it completely in your favorite browser, and enjoy the colorful experience of viewing and reading this AWE-INSPIRING chart of God's glory! "The 7 Day Creation Chart"
Approximately 714 Weeks (Sabbaths) Remaining Till Christ's Return! 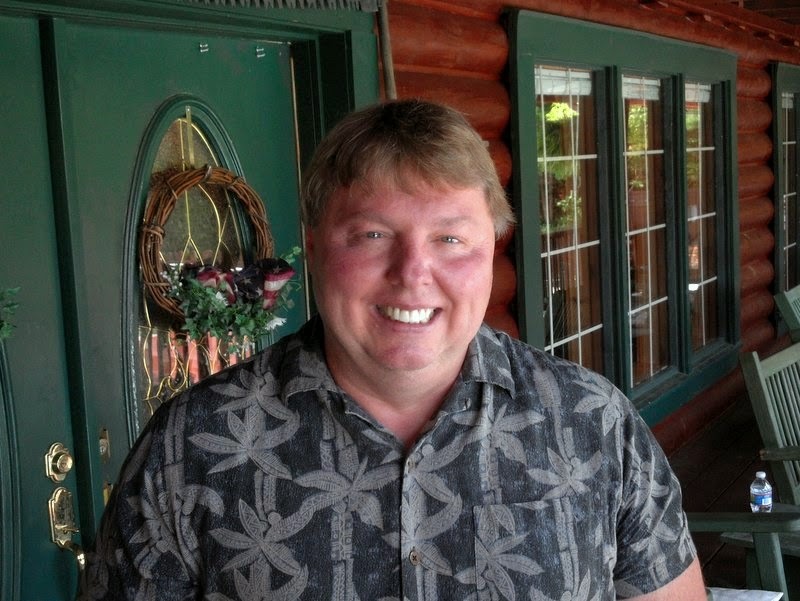 Terry Bennett received a prophetic message from the angel Gabriel back in December AD 2001. Gabriel told him that planet Earth would go through a 21 year time period (3 sets of 7 years) starting in the year AD 2008 until the end. That would be years 2008 to 2014, then 2015 to 2021, and then lastly 2022 to 2028. I don’t know much about Terry Bennett, but I was informed of him and his message this past week. It is shocking! So I’m posting a link below of what he was told for your benefit. I’ve listened to his message, and I believe he is telling the truth! Time will soon tell. Things may start “heating up” in 2015! Approximately 715 Weeks (Sabbaths) Remaining Till Christ's Return!